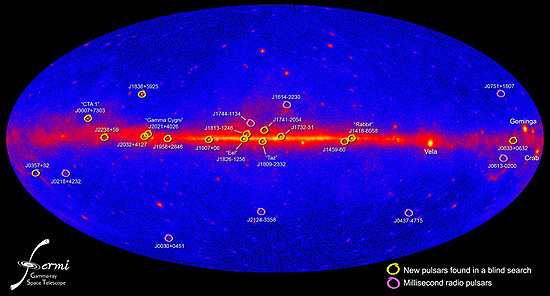 This all-sky map shows the positions of 16 new pulsars (yellow) and eight millisecond pulsars (magenta) studied using Fermi's LAT. Credit: NASA/DOE/Fermi LAT Collaboration. A new class of pulsars detected by NASA's Fermi Gamma-ray Space Telescope is solving the mystery of previously unidentified gamma-ray sources and helping scientists understand the mechanisms behind pulsar emissions. A study to be published by an international team of scientists in the July 2 edition of Science Express describes 16 pulsars discovered by Fermi based on their pulsed emissions of high-energy gamma rays. A pulsar is a rapidly spinning neutron star, the dense core left behind after a supernova explosion. Most of the 1,800 known pulsars were found through their periodic radio emissions. "These are the first pulsars ever detected by gamma rays alone, and already we've found 16," said coauthor Robert Johnson, professor of physics at the University of California, Santa Cruz. "The existence of a large population of radio-quiet pulsars was suspected prior to this, but until Fermi was launched, only one radio-quiet pulsar was known, and it was first detected in x-rays." Johnson and other physicists at UCSC's Santa Cruz Institute for Particle Physics (SCIPP) identified the gamma-ray pulsars using computational techniques they developed to comb through data from Fermi's Large Area Telescope (LAT). Marcus Ziegler, a postdoctoral researcher at SCIPP and corresponding author of the paper, said detection of gamma-ray pulsations from a typical source requires weeks or months of data from the LAT. "From the faintest pulsar we studied, the LAT sees only two gamma-ray photons a day," Ziegler said. Of the 16 gamma-ray pulsars found by Fermi, 13 are associated with unidentified gamma-ray sources detected previously by the EGRET instrument on the Compton Gamma-ray Observatory. EGRET detected nearly 300 gamma-ray point sources, but was unable to detect pulsations from those sources, most of which have remained unidentified, said Pablo Saz Parkinson, also a SCIPP postdoctoral researcher and corresponding author of the paper. "It's been a longstanding question what could be powering those unidentified sources, and the new Fermi results tell us that a lot of them are pulsars," Saz Parkinson said. "These findings are also giving us important clues about the mechanism of pulsar emissions." A pulsar emits narrow beams of radio waves from the magnetic poles of the neutron star, and the beams sweep around like a lighthouse beacon because the magnetic poles are not aligned with the star's spin axis. If the radio beam misses the Earth, the pulsar cannot be detected by radio telescopes. Fermi's ability to detect so many radio-quiet gamma-ray pulsars indicates that the gamma-rays are emitted in a beam that is wider and more fan-like than the radio beam. "This favors models in which the gamma rays are emitted from the outer magnetosphere of the pulsar, as opposed to the polar cap much closer to the surface of the star," Saz Parkinson said. The very intense magnetic and electric fields of a pulsar accelerate charged particles to nearly the speed of light, and these particles are ultimately responsible for the gamma-ray emissions. Because the rotation of the star powers the emissions, isolated pulsars slow down as they age and lose energy. But a binary companion star can feed material to a pulsar and spin it up to a rotation rate of 100 to 1,000 times a second. These are called millisecond pulsars, and Fermi scientists detected gamma-ray pulsations from eight millisecond pulsars that were previously discovered at radio wavelengths. Those results are reported in a second study also published in the July 2 edition of Science Express. "Fermi has truly unprecedented power for discovering and studying gamma-ray pulsars," said Paul Ray of the Naval Research Laboratory in Washington. "Since the demise of the Compton Gamma Ray Observatory a decade ago, we've wondered about the nature of unidentified gamma-ray sources it detected in our galaxy. These studies from Fermi lift the veil on many of them." The corresponding authors of the first paper include Ziegler, Saz Parkinson, Ray, and UCSC graduate student Michael Dormody. Nine of the paper's coauthors are affiliated with UCSC, including William Atwood, adjunct professor of physics, who came up with the original design concept for the LAT as well as the concept for the algorithm to find gamma-ray pulsars. Much of the computational work was carried out on the UCSC Astronomy Department's Pleiades supercomputer. The second paper also has nine coauthors affiliated with UCSC. NASA's Fermi Gamma-ray Space Telescope is an astrophysics and particle physics partnership, developed in collaboration with the U.S. Department of Energy, along with important contributions from academic institutions and partners in France, Germany, Italy, Japan, Sweden, and the U.S. Images related to this release are available from the NASA web site.